One of the steps in the Scientific Method of Investigation is the publication of your obtained results. This is done, so that others by repeating the same experiment using same methodology may independently arrive to the same conclusion and verify whether it is true what you have accomplished with your own hypothesis. Once many independent laboratories—through their scientific research—confirm your results, then, the hypothesis that you have proposed becomes accepted and your findings acknowledged. I have said before, and I stand by my assertions that: (a) Macedonia was never a part of any ancient Greek city-state, nor were the ancient Macedonians ever considered by the ancient Greeks or by themselves, to be Greek. (b) Macedonia was never a member of any Hellenic League. Macedonia was not a member of the Greek Amphictyonic League either. Fact is that membership into these leagues was reserved for Hellenes only. And since Macedonians were not considered Hellenes, they were not admitted into these leagues. There is no record of either side voicing displeasure regarding this rule. And (c) in antiquity people knew that the boundary between Macedonia and Greece was the river Peneus and mount Olympus; to the south were the Greek tribes and to the north was Macedonia. I challenge all of you lecturers of history, including Professor Stephan Miller and his like-minded historians, to dispute my assertions and prove me wrong. When you claim or support a claim that "Macedonia was always Greek", it is incumbent upon you—academic standards compel—to find at least one shred of evidence from the ancient chroniclers and bring it forward. Find other authors from antiquity who will agree with your own assertion. And please, instead of shielding yourself with ambiguous interpretations from the 18th and the 19th century philhellenic writers, convince the readers with valid, persuasive arguments. Bring to the table solid, irrefutable evidence from the ancient Greeks themselves or their contemporary Greek or Roman biographers and chroniclers. I will go on the limb and reiterate my opinion regarding the ethnicity of the ancient Macedonians: Anyone who claims that ancient Macedonia was a Greek land and that ancient Macedonians were Greeks or that Macedonians are stealing Greek heritage, is nothing less and nothing more than a corrupt, deceitful fabricator of history whose (scientific) thinking—devoid of substance—is based on personal beliefs and mythical constructs. Facts are not derived from beliefs or mythology. Scientific knowledge does not rest on feelings, nor is it supported by bad-time stories and mythology. Science needs concrete, verifiable evidence. (1) you will be unable to prove Strabo, Scylax, Dichaerchus, Scymnus, and Dionysius wrong. These biographers have stated that Greece commences at the Ambracian Gulf, and terminates at the river Peneus. (2) you will be unable to prove Aeschines, Theopompus and Pausanias wrong, for not including Macedonia on their lists of the Amphictyonic people of Greece. (3) you will have no answer as to why Thucydides found no room for Macedonia on his list of states on either side of the warring parties in the Peloponnesian War. Macedonia is found neither on the Athenian, nor on the Lacedaemonian side. These are hard facts that cannot be dismissed with lame excuses and manipulation of text. One cannot disregard evidence of this magnitude and bring forward a pitiful assertion like ´Macedonians spread Hellenic culture in the East´, instead. One cannot substitute and equate the words of a king (Philip V) "My ancestors Philip II and Alexander the Great conquered Greece", with "but Macedonians had same names as Greeks", nonsense. You can saturate the media with slogans and cry "thieves" as long as you want, but you will be unable to subvert and change the evidence left from the ancient authors. Fact is that you have bought some professors to put their whimsical shoulder on your "Greek" wheel, but fact is also that you are stuck in the mud of lies up to your knees and cannot move. "As one of the powers which had guaranteed the independence of the Greek Kingdom in 1828, Great Britain held the position that the Greek claims to extension of their territories were greater (as of 1880) than the boundaries which the Greek city-states held in antiquity. This position was brought forward by Major J.C. Ardagh, (later became Sir Major-General). He was part of the British delegation that was attached to the Special Embassy during the Congress at Berlin on June 3rd, 1878. He was also appointed as her Majesty´s Commissioner for the delineation of the frontier of Bulgaria (September 7th, 1878); and was employed during the conference at Constantinople in 1881. Sir J.C. Ardagh was born on August 9, 1840, and died on September 30th, 1907. Before the Conference at Constantinople, Major Ardagh communicated with the British Foreign Office on the issue of the new Greek frontier with his "Memorandum on the Ancient Boundaries of Greece", which was received at the Foreign Office on February 24th, 1881. The information which Major Ardagh presented in his memorandum (quoting sources from antiquity) reaffirms claims made by Macedonians today that, Macedonia was never part of any Greek (Hellenic) state during ancient times. If ancient Greek sources did not see Macedonia as part of the "Ancient Greek World", how can the modern Greek state see Macedonia and its people as Greek? What Major Ardagh´s memorandum does raise is questions not only to the issue of the true Greek frontier, but also to the true identity of the people of Macedonia. Since 1913, the end of the Second Balkan War when Greece, Bulgaria and Serbia and Montenegro divided up Macedonia amongst themselves, Greece has been claiming that Macedonia was always Greek. Major Ardagh discredits this claims by quoting ancient Greeks themselves and shows that not only was Macedonia not Greek or part of ancient Greece and neither was Epirus or Thessaly. As the claims of the Greeks to an extension of territories are in some degree based upon the limits of the ancient Greece, I conceived that an examination of the early Greek geographers would throw some light upon them, and I have been able to procure, and annex extracts from them in Greek with translations. Strabo, Scylax, Dichaerchus, Scymnus, and Dionysius all concur in making Greece commence at the Ambracian Gulf, and terminate at the river Peneus. The catalogue of the ships in the Iliad, the various lists of the Amphictyonic tribes, the states engaged in the Peloponnesian war, the travels of Anacharsis , the description of Greece by Pausanias, and the natural history of Pliny—all give proof of the same fact, by positive or negative evidence; nor have I found anywhere a suggestion that Epirus was Greek, except that Dodona, the great oracle, though situated amid barbarians, was a Greek institution, and the legend that the Molossian Kings were of the house of Aeacidae. When Epirus first became powerful, 280 B.C., Greece had long been under the complete ascendency of the Macedonians, and after the fall of the Empire at the battle of Pydna, 168 B.C., it became a Roman province in 148 B.C. The establishment of Greek independence in 1832 was exactly 2,000 years after the battle of Pydna. (1) The tribes extending beyond the Ambracian Gulf to the eastward, and contiguous with the Peloponnesus, are Greek. (2) The tribes from the Strymon to the Pontic passes and Haemus are all Thracian, except on the coast which is inhabited by Greeks. (3) On the right of the entrance (of the Ambracian Gulf) dwell the Acarnanians, a Greek tribe. On the left is Nicopolis and the Kassopaeans, an Epirote tribe. 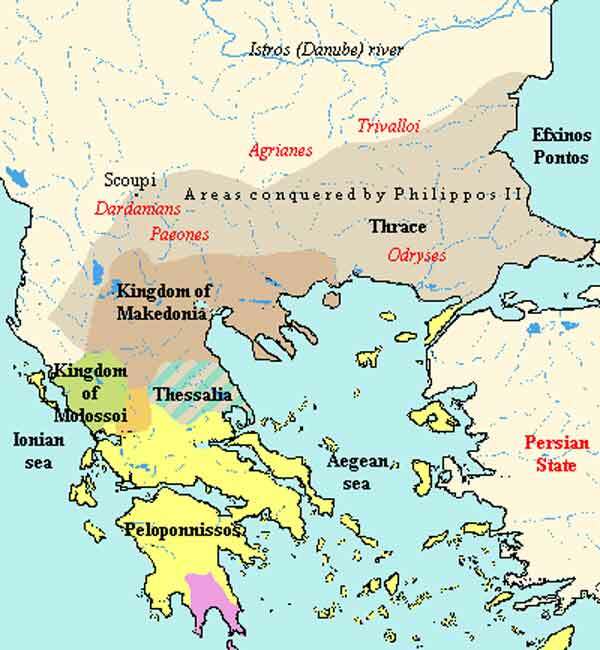 (4) The Peneus divides Lower and Maritime Macedonia from Thessaly and Magnesia, and Haliacmon Upper Macedonia. (5) But the Peneus bounds Macedonia towards the north, and Thessaly towards the south. (1) From Ambracia Greece is continuous (along the coast) as far as the river Peneus. (2) Up to this point (the country of the Magnesians) Greece is continuous from Ambracia. (1) I therefore draw the limits of Hellas at the country of the Magnesians, i.e., to the Vale of Tempe. (2) Greece is continuous from Ambracia to the Peneus. In the catalogue of the ships in the second book of the Iliad, Acarnania, Aetolia and Thessaly are the most northern districts mentioned. The others are Boetia, Phocis, Locris, Euboea, Athens, Salamis, Argos, Mycinae, Laconia, Messenia, Arcadia, Crete, Rhodes, and Isles. Aeschines: Thessalians, Boeotians, Dorians, Perrhaebeans, Magnetes, Locrians, Aeteans, Phthiotes, Maleans, Phocians. Of these, none belong to Epirus; indeed there are neither Aetolians nor Acarnanians. The next catalogue which throws light on the subject is that of forces under the command of Leonidas at Thermopylae. Peloponnesians, Thespians, Thebans, Phocians, and Locrians (or Milesians). Forming in fact, something less than the present limits of Greece. With the Athenians: Chians, Lesbians, Plataeans, Messenians of Neopactus, most of the Acarnanians, the Corcyraeans, Zacynthians, with certain islands and colonies. Anacharsis: Travels in Greece, 357 B.C. There are 14 other nations in Epirus. Pliny: Natural History, book IV: He places mount Olympus in Thessaly, but does not precisely define the boundary of Macedonia, which he describes as extending to the Adriatic." With this illustration by Ardagh, the Greek cries of "Macedonia is Greece", is shown once again to be nothing more than a fabrication. The ancient boundaries of Greece do not coincide with the modern Greek borders. These ancient frontiers of Greece are the basis which the present Greek state is using for the claims on Macedonia. This is certainly another piece of evidence that reaffirms the inadmissibility of the Greeks´ claims that "Macedonia was always Greek". Time and again, this blatant lie is being exposed for what it really represents—a flagrant and shamelessly executed subversion of historical truth—heist of unparallel historical proportions never before seen in the history of mankind. What is so arrogantly flaunted as Greek heritage is nothing but a stolen property from the Macedonians. Between these rampant Greek lies and deceptions and the silence of the European academicians, who, certainly, know the truth, runs the menacing current of the biased and the hypocritical attitude of Europe itself. Human rights issues in Greece are of paramount importance and Europe remains silent. By not addressing these obvious violations of its own constitution, Europe undermines its own reputation. By not attending to these flames of hatred and racism exhibited by the Greek government, Europe diminishes its own stature and weakens its own institutions. Europe must find courage to tell Greece, simply to "grow up", as said by former US Secretary of State Lawrence Eagleburger in the interview for the Macedonian Television. And in the words of the former German ambassador to the Republic of Macedonia, Hans Lothar Schteppan, Europe must recognize that "Greece’s strong objection to the name was laid on a foundation of lies".